Popular flame-inspired design, the Loyalty Series provides a versatile and affordable trophy option in 3 convenient award sizes. 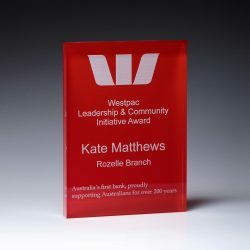 Acrylic ideal for an enhanced engraving effect for that prestigious corporate award. Each size of acrylic is available in a nice presentation gift box. Part of the extensive range of corporate awards on offer – in acrylic, crystal and glass.